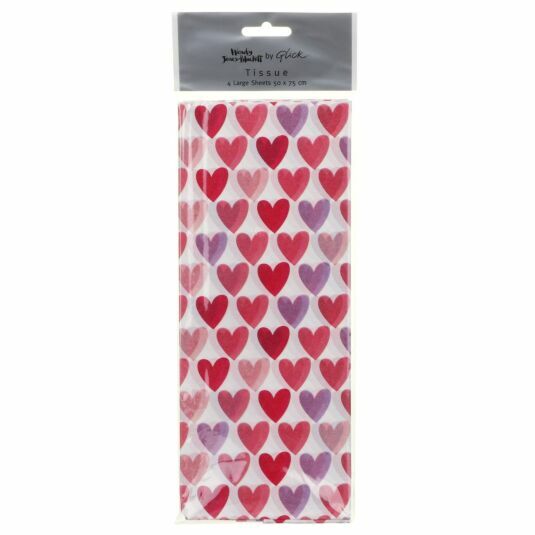 Wrap your presents in style with this elegant Hearts Luxury Tissue Paper. Decorated with gorgeous pink hearts in various shades and tones, this white tissue paper is a little extra something to show your loved one how much you care. One pack contains 4 large sheets that each measure 50cm x 75cm. Perfect for lining gift boxes, filling gift bags or simply wrapping up a thoughtful gift to give to your loved one on any special day! Glick are delighted to be working with award winning greeting card publisher Wendy Jones Blackett. The designs are taken from the ever popular range of cards and each design is printed onto a heavy textured paper with 2 hot foil stamp colours.